Fill the pasta with the nut mixture. 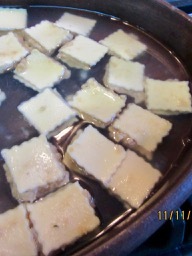 Place the ravioli in boiling water for 5-6 minutes, or until they float. You can also test for doneness by nibbling on the edges to test. Heat lard with fresh melted pork fat in a copper or bronze pan. When hot fry the cakes. When done remove them with a skimmer and put them on a platter. 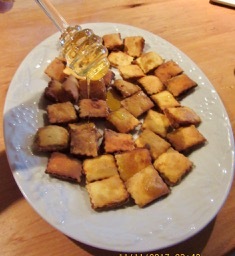 Sprinkle with rosewater and drizzle with honey; serve immediately after sprinkling with sugar and cinnamon. Carroll-Mann relates that Veronika (?) Leimgruber claims that this is an adaptation of the Italian word ravioli. This is documented in Italy from the 14th Century. The English Forme of Cury calls them "rauioles." These were normally filled with cheese, making Nola’s recipe unique as there is no cheese in the ingredients. As ravioli was homemade until recently, it did not necessarily have to be squared and the stuffing was up to the cook. 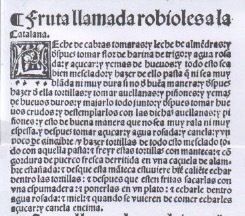 The Medieval Spanish Chef made pastries with this recipe, which were very tasty. See blog titled manteca published March 16, 2016 for the recipe. Ravioli can be homemade but ready made ravioli is an option.